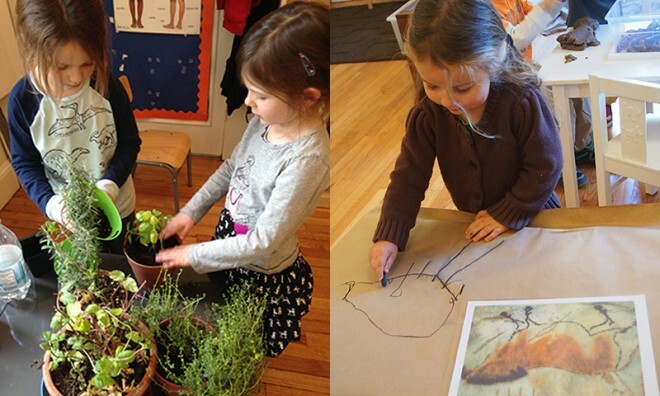 Our inquiry-based learning involves taking multiple disciplines and applying them to an engaging activity. It is about crossing boundaries and lines of thought to create something new. It allows our students to gain and practice specific skills while engaging actively with ideas, concepts, and facts. A study of the human body can lead to discussions and explorations on symmetry and movement. Learning about the post office allows our kindergartners to practice their writing and learn how to alphabetize as they sort letters and then deliver them, and leads to a study of geography as they learn about the different places where letters can go. Reading about the pilgrims takes our students outside, where they measure by fives to create an outline of the Mayflower, and then imagine a hundred people traveling for months inside that space.